The following photos and the video were taken by Gudrun on the 29th of December 2009. There was not so much snow on the ground but enough to make our Knuti glad. October 2010 was only the last October during Knuti’s short life. Who could have thought what was going to happen only a few months later. They say time heals even the deepest wounds but our wound is still open …. This time I want to show you LeenaP’s wonderful photos of our Knuti boy. He was a master of changing his fur colour from white to cappuccino in no time at all! I have no problems with my tan! This story was first published on the 25the of July 2009. I think it deserves to be read and seen at least once more ….. Our magic bear always talked to me! Dear friends! This time I want to show you some of my Summer collages with Knut. Each and every picture brings back the wonderful feeling I had making them. When the Spring comes I always remember the meetings in Berlin when Knut was still there. The weather was often warm, the trees and bushes were getting green offering a wonderful ‘background’ to our visits in the zoo. 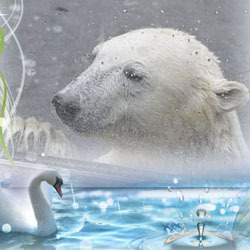 Our magic polar bear’s life was very special – unfortunately far too short. Even his passing was very special and hopefully the recently found cause of his death will help other animals. Maybe we will see more miracles ….. Happy 8th Birthday, Bear Angel Knut! It’s already the 8th anniversary of the Miracle in Berlin – the day when you were born. Again many of us are gathered to celebrate this special day and remember all the wonderful moments we had with you. Log in | 48 queries. 0.779 seconds.